I think I could eat warm homemade bread slathered with this peach jam for breakfast every day for a week and still love it. 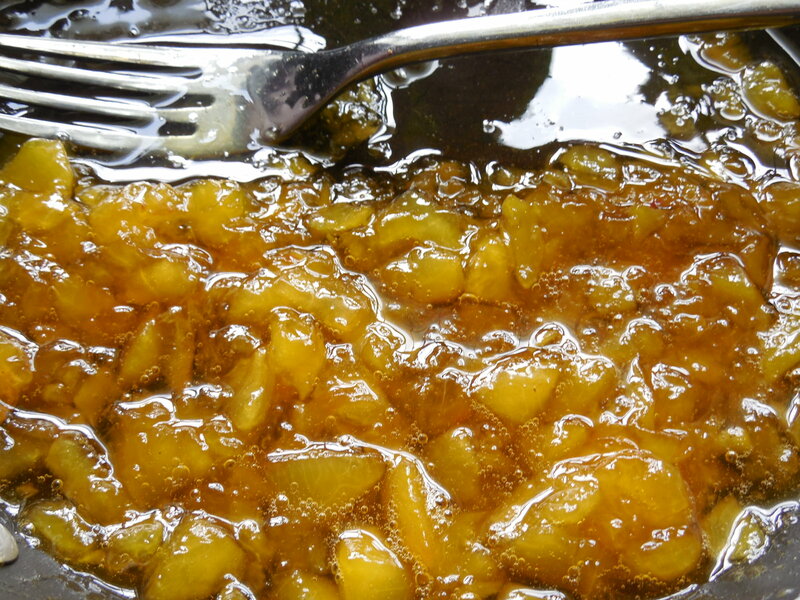 Fresh peach jam bursts with intense flavor. Peaches are in season now in North Florida, and by using just a little sugar as I do in this recipe, you can really let the peaches be the star. 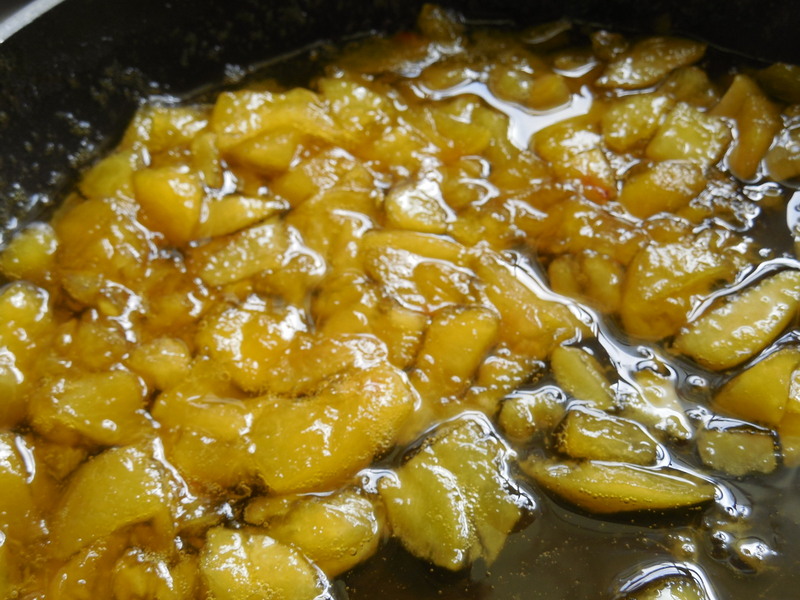 The ingredient list is simple: 1 1/3 cup of peeled finely chopped peaches(about 5 medium), 1/2 cup sugar. This recipe will make one half pint (one cup) of jam. NOTE: I just got 75 lbs of peaches, and will be making full batches with 8 cups of chopped peaches and 4 cups of sugar. Yield is approximately 6 half pints. If you want to can them, process in boiling water for 10 minutes. Don’t try to double a full batch, as trying to make too much jam at once or it may not set properly. 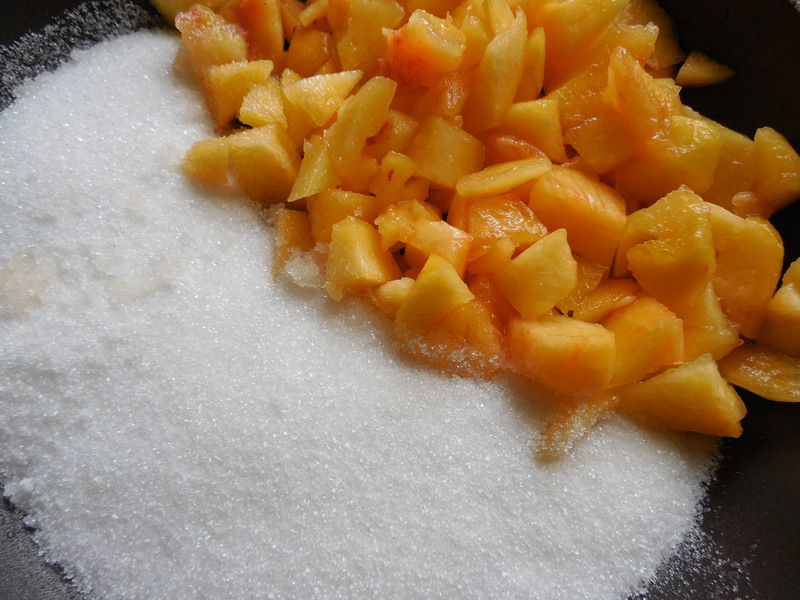 Cook the peaches and sugar over medium-high heat, stirring often. Cook until the jam has jelled, using the cold plate test explained in my Easy Two Ingredient Strawberry Jam Recipe post. This will take 10-15 minutes. Stir occasionally. You can see in the second picture how that it has become darker in color and how that the syrup looks thicker. Time to put the yumminess into a jar! Let it cool slightly, then cover and refrigerate. I just love looking at the pretty colors in this picture. If you can make mac-n-cheese from a box, you can make this jam. You will love how easy it is and your family will love to eat it! 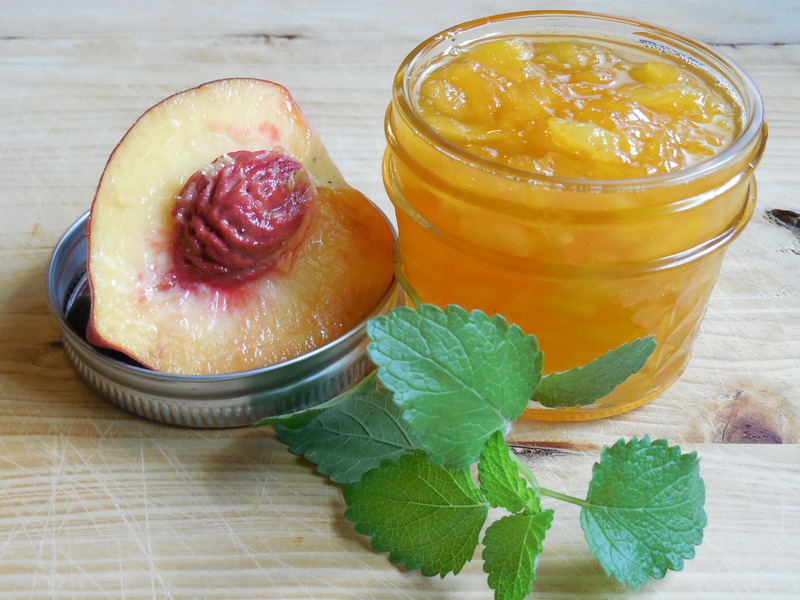 If you’re somehow one of those people that doesn’t like peaches, you can try my easy strawberry jam recipe or my quick blueberry jam. One of my favorites is my small batch blueberry peach jam. Those recipes are great for a beginner and are very good. Be sure to check out my no-slime okra recipe! I can’t wait for Michigan peaches to come in. The way our produce is going this year though I’m not sure we’ll even have any. Cherries were scarce and blueberries are following suit. Maybe I’ll check the local produce market and see if they are bringing in any Florida peaches. Can’t wait to make some peach jam too! Nothing like fresh peach jam! I really wish more people tried to make jam; it is so simple with fantastic results! I can’t imagine not canning. The satisfaction I get when I finish a batch of anything is such a rush. I like my stash of canned jams too, but sometimes it’s nice to just make a little fresh jam without the pressure of having to can them. I’ve seen some of your canning posts- you go all out! You have some yummy recipes! I just stumbled across this while I was looking for a peach jam recipe! I bought some peaches at the farmers market this weekend and was thinking about what to do with them-since I bought too many but not enough for a full batch of jam. I will give it a try. Thank you so much! You’re welcome! It really is easy and tastes so good. I’d love to hear what you think! I’m so glad you liked it! Let me know how you like the blueberry one; I think it is a good combination. Thank you for visiting my blog Sarah. I love this simple jam recipe. I like the idea of just being able to make a small quantity, and less sugar. Yes, I prefer to use as little sugar as possible when I have access to local fresh fruit.